(Nanowerk News) Scientists from the MESA+ Institute for Nanotechnology at the University of Twente in the Netherlands have designed a novel type of reso­nant cavity that serves as a prison for photons. The cavity confines light in all three dimensions in space inside a photonic crystal. The crystals have a struc­ture similar to how atoms are arranged in diamond gems. Confining photons has many applications in optics (efficient miniature lasers and LEDs), communication technology (on-chip storage bits of information), and even in life sciences (tiny, yet sensitive sensors of phar­maceutical materials). The results appear in the leading journal Physical Review B ("Design of a three-dimensional photonic band gap cavity in a diamond-like inverse woodpile photonic crystal") that is published by the American Physical Society (APS). Figure 1: Design of a prison for light in a di­amond-like photonic crystal. The top-side of the crystal has been lifted to reveal the inner structure. The crystal has a diamond-like structure, made of two sets of mutually per­pendicular pores that are drilled in silicon (blue-colored backbone material). To realize a resonant cavity, one pore in each set (indi­cated by black arrows) has a smaller diam­eter. At the intersection of these two pores, a point defect appears in the crystal. Extensive computations reveal that light is confined in a tiny volume about this point, as indicated by the yellow-colored region. In optics, resonant cavities are widely used for their ability to store light in a limited space for a particular duration in time. A generic cavity consists of two mirrors sepa­rated by a length of transparent material. Light bounces back and forth between the mirrors. Since light is an electromagnetic wave, it appears that only waves whose wavelength (or color) matches the cavity length can exist in the cavity. This is the result of constructive interference where crests and valleys of many waves coincide to add up to a high intensity. Hence, the allowed waves resonate to form a standing wave in the cavity. Light does not circulate indefinitely inside a cavity, since on every roundtrip part of the light energy leaks out. An important leakage is caused by the fact that mirrors usually do not reflect light in all directions. In many travel directions of light, it misses a mirror and then escapes the cavity. Such unwanted escape could be halted if one had special mirrors for all three dimensions simultaneously. And this is exactly what the design of the Dutch team employs. The new design is based on three-dimensional photonic crystals. These structures are well-known for their ability to control the emission and propagation of light. They have a periodic geometry that ensures that a certain color of light is forbidden to exist inside the crystal. The light cannot enter the crystal as it is reflected, no matter in which direction it travels. In an analogy to the properties of semiconductors, this ef­fect is called a “photonic band gap”. Within the band gap crystal, the forbidden color of light can exist in a small volume, when a point defect is introduced. Since such an optical cavity is surrounded by the photonic band gap crystal – that acts as a three-dimensional mirror for light – light cannot escape: it is locked in a prison. 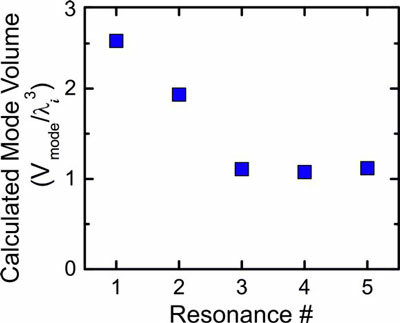 Figure 2: Calculated mode volume for five different resonances that appear in a cavity shown in Figure 1. The volumes for imprisoned light are normalized to the cube of the wavelength of light. Extremely small mode volumes are found, indicating the strong confinement of light in these 3D “prisons for light”. Making a photonic cavity is challenging since it must be made deep inside a three-dimensional structure, a place that is usually hard to reach. 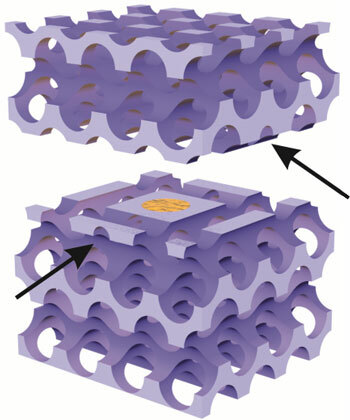 Hence the Twente team came up with a simple design: they employed a diamond-like crystal that is composed of two sets of perpendicular pores, shown in Figure 1. Such crystals have a record-wide band gap, which provides a strong shielding of the cavity. One pore in each set has a smaller diameter, and at their intersection a point defect appears. Light then becomes imprisoned in a tiny volume about the defect, as indicated by the yellow-colored region in Figure 1. Extensive computations reveal that the volume of the photon prison is only 2.5 times the wavelength of light cubed (see Figure 2), in other words, as small as one thousandth of one millionth of one millionth of a liter. Previously, the team had shown that diamond-like photonic band gap crystals can be etched in silicon, with techniques commonly used in the semiconductor chip industry. The new cavity design can be applied during the routine fabrication of these photonic crystals. Thus, it will soon be possible to make a prison for light on a chip. This opens up the exciting prospect to integrate ultrafast photon manipulation with existing elec­tronic information manipulation. The research has been performed by Dr. Léon Woldering, from the Transducers Sci­ence and Technology (TST) chair, and by Prof. Allard Mosk and Prof. Willem Vos from the Complex Photonic Systems (COPS) chair, at the MESA+ Institute for Nano­technology of the University of Twente in Enschede, The Netherlands. The project was supported by ERC, and the Dutch science agencies NWO, the physics founda­tion FOM, and technology foundation STW.